Asia Research recently concluded its 8th annual cross-industry staff satisfaction survey. Conducted online among 286 market research professionals across Asia, including 64 from client organisations, this survey has tapped the sentiment of a range of research professionals to assess their levels of satisfaction with their current employer, their loyalty, and their salary increment expectations. We also tracked changes in working hours and sales activity, which can be indicative of the level of ‘stress’ the research industry is under. 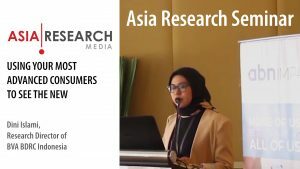 The survey represented a range of agencies including the ‘Big 4’ (Nielsen, Ipsos, Kantar TNS, and Kantar Millward Brown), other global agencies, Asian agencies (those headquartered in their own country, or within Asia), and support industries such as panel and research technology companies. The survey also covered the full range of management levels from Research Executives to Managing Directors. We observed that the supply side of the market research industry (e.g. the agencies) still depends a lot on foreign talent, with about a third of our sample being expatriates (somewhat skewed by the high representation of more senior staff in our survey), in contrast with client-side organisations where only 16% of employees are foreign and the remaining 84% are from the local market. The years of experience among those working client side has been consistent across the various surveys we have conducted (about 10 years on average), but has been rising for middle-management levels within agencies since the start of the decade—for example, an Associate Director now has on average 11 years’ experience compared to 9 years in 2011. This suggests that the speed with which agencies are promoting staff is slowing down, contrary to some views that researchers are being promoted early to stop them from switching to competitors. Since 2015, there has been a modest increase in the number of hours that researchers work in the week, indicating that demands on staff have become a little higher in the last year. Today the market research industry has typically an almost 50-hour working week, with little variation across the management levels, except among Managing Directors, who work close to 53 hours a week on average. The amount of time agencies spend on selling has increased slightly over the years, from 23% of the working week in 2010 to 29% today, but there has been no increase in the level of proactive selling (i.e. seeking new business opportunities instead of responding to inquiries that come in). This indicates a fairly stable situation of demand vs. supply within the research industry. Furthermore, expectations for salary increment at 9-11% across the region suggest that the research industry is in reasonably good shape despite the various challenges that Asia Research has reporting on in our Stakeholder Survey, such as tighter margins, more insourcing of research to client organisations, and more supply. People working in the market research industry are generally happy with their employment, with 25% reporting ‘high satisfaction’ (a score of 9 or 10 out of 10), and another 52% claiming to be ‘satisfied’ (7 or 8 out of 10). This level of satisfaction has grown since 2014, which was a rather difficult year for the industry, when satisfaction levels—particularly within middle to senior management—fell considerably from the previous year. 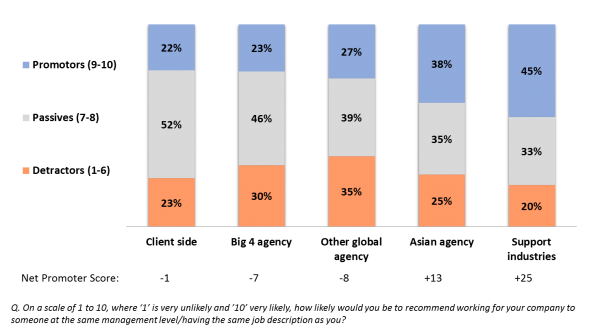 Across the various types of employers, people working client side are happier overall compared to those working in agencies. Those working for the Big 4 agencies are a bit less satisfied than their counterparts in other global firms and Asian firms, but sentiment in the Big 4 has improved in recent years. Net Promotor Score (NPS) is a new measure introduced to the recent Asia Research staff survey to show whether people would recommend working for their company to others. 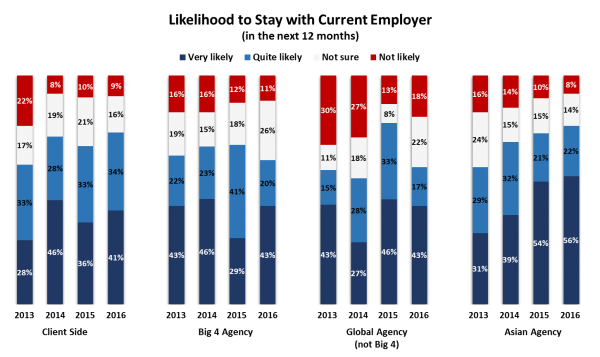 This has revealed a greater contrast between the different types of employer and demonstrates how much more useful this measure is compared to straight satisfaction ratings (see Chart 1). People working in Asian agencies, are more likely to recommend their company for employment compared to those working in the Big 4 or other global firms. But, more significantly, the market research support industries (e.g. panel and research technology companies) have far more ‘promoters’ of their companies. Based on past research conducted by Asia Research, the panel companies have been more progressive in developing employee value propositions—for example, through creating a dynamic company culture very much associated with technology companies in general, meaning they are often thought of as being some of the most desirable places to work. While the HR departments in the mainstream agencies have evidently addressed some of the staff issues in the last few years (resulting in improving customer satisfaction scores), they could be missing a number of tricks that the market research support industries are implementing in terms of creating better working environments or a better company culture. Those who would recommend their company to others state that the reasons underlying this are the ‘good work culture’, the teams they work with, the management, and the flexible working arrangements. They also point out the career opportunities within the company, the opportunities for personal growth, and the brand name of the company itself. Notably, remuneration ranked quite low as a reason to promote a company to others. Among the Detractors, the reasons for not recommending their company are more diverse but again are less about remuneration. They highlight disorganisation, poor management, and lack of direction in their company, including uncertainty over the future of the company and the ‘remoteness’ of their HQ. 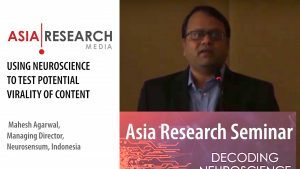 In order to examine in more depth (at least in the context of an online quantitative survey), Asia Research introduced a new module to this year’s staff satisfaction survey. We examined the nature of the management styles that prevail in the industry, what is important to people in these management styles, and which styles they seek to emulate within their own direct line reports. 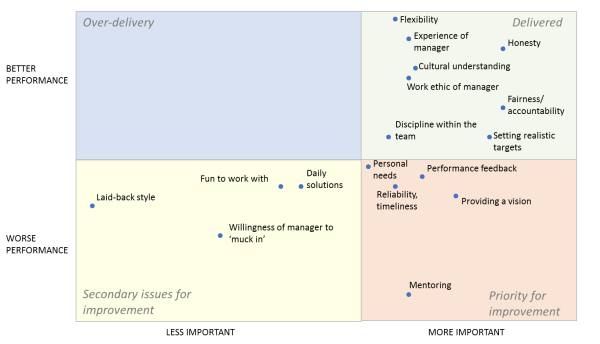 From a list of 17 attributes, we looked at the absolute importance of each, and the extent to which current line managers were delivering on them (see Chart 2). Chart 2. Levels of delivery of the different elements of management styles. The most important elements of management style (to the subordinate) are the honesty, fairness, and accountability of the manager (e.g. whether they are open and will treat people equally). Somewhat linked to this is the manager setting realistic targets for the employee. These are areas in which managers are currently performing quite well. In tandem with these overarching ‘people skills’, staff want to have a manager who is also capable and hard-working—for example, they are technically strong and knowledgeable in research and willing to put in the same level of effort as the subordinate, if not higher. However, the expectation to ‘muck in’ (e.g. to take on work that more junior people would do, in order to help out) is less important to staff. Again, in most of these areas, managers are currently delivering as expected, although fewer managers are doing the ‘mucking in’. Given that a third of agency-side employees are foreign, the need for cultural sensitivity is also important. A manager also needs to instil some discipline into their team, while at the same time giving flexibility to staff; the latter is actually the highest performing area for managers. Areas in which managers perform less well are in providing the vision for the company, giving good performance feedback to the employee, and particularly in training and mentoring the staff, specifically in helping the staff to learn and develop their careers. Clearly the needs vary a lot by the seniority of the staff. Not surprisingly, the more junior staff place more importance on mentoring because they want to develop their careers quickly. For Research Directors and Directors (i.e. those who are senior but not quite at the top of their careers), providing a ‘vision’ for the company is particularly important as they seek more ‘meaning’ in their work beyond just dealing with day-to-day issues. Managing Directors (MDs), who are usually reporting into the CEOs, generally place less importance on the management qualities of their seniors, but the one quality that does stand out as being of utmost importance is the honesty and sincerity of the CEOs. However, 24% of MDs say the CEOs are ‘poor’ or ‘fair’ on matters of accountability, fairness, and consistency of approach. More notably, though, are those in middle to senior positions (e.g. Associate Directors and Directors), who often do not feel they are being set realistic targets. Some also give poor ratings to their managers (e.g. the MDs) on providing a vision for their company. What is evident is that companies have addressed some of the day-to-day operational issues pertaining to HR, but weak leadership can manifest itself in not having a vision for the company nor a goal towards which the team can work, and this is particularly noticed by those who are in positions of seniority but have not yet reached the top of their organisation. 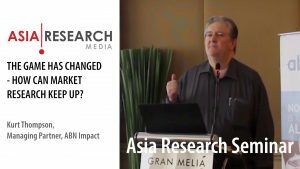 Asia Research has found from its various staff satisfaction surveys over the years that the Asian agencies, being headquartered in Asia, have happier staff compared to their global counterparts. The ‘remoteness’ that can be associated with global companies could perhaps be contributing to the lack of vision. Loyalty to the Asian agency is therefore much higher than among the staff of other employers, and has been rising steadily, whereas for other employers it has been highly variable over the years (see Chart 3). Note: More detailed analysis of the ‘management styles in Asia’ will be shared in a ‘Special Report’ in Q2 and will be presented at the Singapore breakfast seminar in May 2017.